Marta Pagnini was born in Florence on 21st January 1991. She is a gymnast and Italian captain of National Rhythmic Gymnastics Italy and Knight of the Order of Merit of the Italian Republic. Rhythmic gymnasts perform short routines using different hand apparatus – balls, clubs, hoop and ribbon – on an area measuring 13m by 13m. They are awarded marks for difficulty, artistry and execution. Rhythmic gymnastics made its Olympic debut at the 1984 Games in Los Angeles. The team event was introduced 12 years later in Atlanta, with Spain taking gold. Rhythmic gymnastics is one of two Olympic sports contested only by women. The other is synchronised swimming. She grew up in Etruria Prato, historical society that has trained in gymnastics, among others, Jury Chechi , former Olympic gold medal at Atlanta in 1996. In 2011 she won the World Championship gold in the team competition at the World Championships in Montpellier and two silvers, always in teams. She participated in the Olympics in London 2012, where she won the bronze medal with the Italian national team. On 11 April 2014 she was conferred the honor of Knight of Merit of the Italian Republic for the bronze medal won in London in 2012. She was part of the 2010 and 2011 Italian Group that competed at the World Championships that won the Group All-around gold medal. Her teammates also won a pair of bronze medals at the 2012 World Cup Final in 5 Balls and 3 Ribbons + 2 Hoops. She has won a bronze medal at the 2012 Summer Olympics in the group all-around event together with other Group Members (Elisa Blanchi, Romina Laurito, Elisa Santoni, Anzhelika Savrayuk, Andreea Stefanescu). 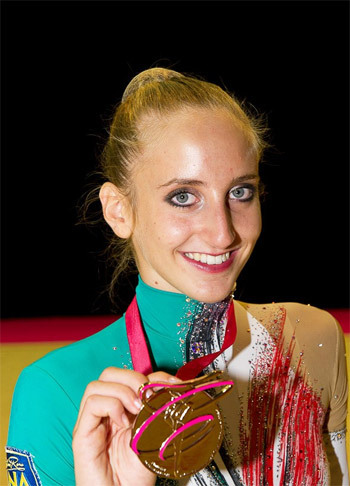 Marta Pagnini an Italian rhythmic gymnast and winner of gold at World Championship 2011 & Olympic bronze medalist 2012. She is in conversation with Namita Nayyar, President Women Fitness. Ms. Namita Nayyar: You started doing gymnastics at an early age and grew up in Etruria Prato, the historical society that has trained in gymnastics like Jury Chechi , former Olympic gold medalist. You reached the pinnacle of success in rhythmic gymnastics when you in 2011 won the World Championship gold in the team competition at the World Championships in Montpellier. What factors you consider were responsible that made you achieve that? Ms. Marta Pagnini: Before starting gymnastic I have been attending a ballet school. But, after two years, weary of this, I moved on gymnastics. At the beginning I considered gymnastic to be only fun, but afterwards, I became aware of having the ability to go further I became very keen on this wonderful sport which has became nearly a job! Certainly there are lots of difficulties, together with the injuries and hard moments, that had made me stronger as an athlete but also as a girl, giving me the force to never give up, even when all seemed to go in the wrong way! My family has played a fundamental role in it, because it has always pushed me to go on and gave me the determination, that has always marked me and Olga, my trainer, I’ll never stop to thank her.